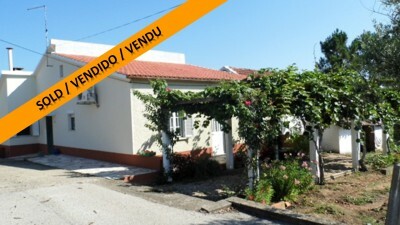 A two bedroom detached house with 9,724 sqm of land for sale near Martinchel, Central Portugal. The house has been well maintained and has been modernised over the past years, such as new roof, double glazed windows with external traditional shutters, air conditioning in the living room and main bedroom and central heating. The house briefly comprises in two bedrooms, living room, big hallway kitchen and a bathroom . All the rooms have concrete tiled floors and concrete ceilings. There are several storage rooms attached to the main house that have been used as storage and wine cellar but can be converted in more habitation if required. Opposite to the main house there is a garage big enough for one car and work shop at the same time and attached to the garage there is an outside kitchen with the traditional bread oven and a fireplace. The property is set on a plot measuring 9.724 square metres, which is mostly terraced and has lots of fruit trees and has a borehole and a well for irrigation purposes. It has a big water storage tank and a traditional “EIRA” dry circle. The soil is very fertile and has been very well maintained. In the land has olive trees, peach, fig, kiwi, orange, apple, vines, loquat , pear , tangerine ,pine trees and a few more that we probably forgot to mention. ,The house is located in the village of Casal da Serra in Central Portugal. Casal da serra is only 5 kilometres Constancia, Constancia ,which is bounded on two sides by the Rivers Zezêre and Tagus, has several cafes, bars, restaurants, a post office, cinema, library, observatory, supermarket, petrol station, bank and swimming pool. The village is a popular destination for many tourists who enjoy strolling along the banks of the rivers. The property is located in the middle of two big towns, one is Tomar the other is Abrantes ,both are around 20 minutes drive, Tomar is home to the UNESCO listed Convento do Cristo and has a variety of other historical monuments as well as modern day facilities and amenities including supermarkets, shops, bars, restaurants, cinema, bowling alley, swimming pools, health centres, schools, hospital and university. The closest airport to the property is located at Lisbon, which is around one and a quarter by car. Lisbon airport is serviced by a variety of low cost airlines which operate regular flights into and out of the United Kingdom and other European countries.